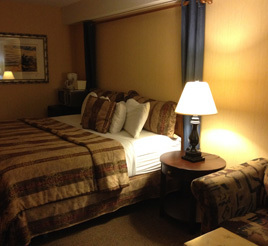 Our Fireplace Room is equipped with a king bed, and in-room fireplace. It also offers a flat screen television, two terrycloth bathrobes, a fridge, a microwave, and a coffee maker, as well as complementary wireless Internet. Amenities: We offer a wide array of services and amenities to suit your pleasure. Some of the listed amenities are available in all rooms, some only in our Club Rooms/Suites, and some amenities are available upon request (subject to availability).